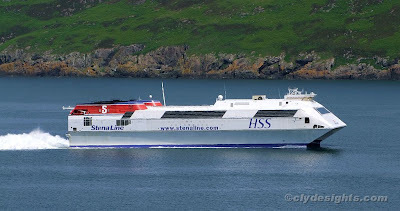 Now likely to be sailing on borrowed time, Stena Line's HSS STENA VOYAGER is the company's principal vessel on their North Channel crossing between Stranraer and Belfast, slightly longer than the rival P&O service. Built in 1996 by Finnyards at Rauma, STENA VOYAGER is one of three similar craft. Using four gas turbines to provide power to waterjets, these massive craft have a service speed of 40 knots, although at that speed fuel costs are astronomical. She is 126.6 metres long, and has a gross tonnage of 19,638 tons. She can carry 1,520 passengers, and 375 cars or 50 HGVs. Recently, one of her sister craft, STENA DISCOVERY, was reportedly sold to South American interests - she was previously employed on Stena Line's service from Harwich to Hook of Holland, but was withdrawn at the beginning of 2007. The third vessel, STENA EXPLORER, is also used on the Irish Sea, and she sails between Holyhead and Dun Laoghaire. why is it on borrowed time and what will replace it? The new Loch Ryan Terminal doesn't have an HSS Berth in its plans. Likely to get newbuild 'conventional superferry' with service speed in the mid 20s, or possibly transfer of one from else where in the Stena network.